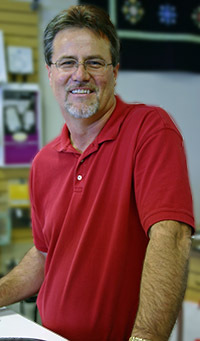 Brad Porterfield is the owner of Sew Vac Outlet (Humble Sewing Center) and has been in the sewing machine and vacuum business since the late 70’s. He is the proud sponsor of the SewVac Outlet (Humble Sewing Center) Blog, an educational & creative resource for sewing, serging, and machine embroidery. Whether locally or via the internet, Brad believes in generously contributing to the surrounding community. On numerous occasions, he has been known to donate new and used machines to various non-profit groups such as a local Girl Scout Troop, churches, quilt guilds, and other charitable organizations. He is glad to be sponsoring this blog, where you will find free patterns, free tutorials, etc. and numerous gift give-aways. It is his way of giving back to you and those like you, the sewers/embroiderers, who make his business possible. Brad hopes that you will benefit from and enjoy what you see here. He invites you to take a moment to come in to his actual store for a visit and see what’s new at the SewVac Outlet (Humble Sewing Center). I would love to sponsor a giveaway of my sewing patterns on your site. I need to know if it has a short or long shank.